Stephen Merritt‘s Magnetic Fields are set to release a new album titled Love at the Bottom of the Sea, on March 6th via Merge Records. The band’s 10th LP will be celebrated this spring, with a long string of dates. They’ll begin in Hudson, NY on its release date, and make their way to Chicago’s the Vic for a two-night run on March 26th & 27th. Tickets have not been posted as of yet, though a fan presale IS active. 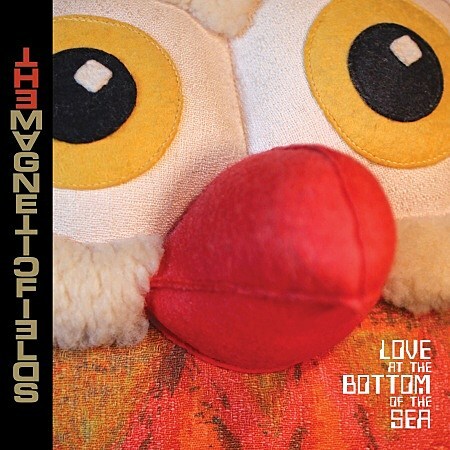 Love at the Bottom of the Sea marks a return to the Fields’ earlier work..
After putting out three synthesizer-free albums, The Magnetic Fields are returning to the signature mix of synth and acoustic sounds they established in the 90s with Merge releases such as The Charm of the Highway Strip and Get Lost. Stephin Merritt has come back to synths with a fresh approach: “Most of the synthesizers on the record didn’t exist when we were last using synthesizers,” he notes. The songs — none over three minutes long — were recorded in Los Angeles, San Francisco and New York with Merritt’s usual cast of collaborators: Claudia Gonson, Sam Davol, John Woo, Shirley Simms, Johny Blood and Daniel Handler. The album is up for preorder via Merge, with all types of exclusives. All 2012 tour dates, and the albums tracklisting, below..